I know, I never do book reviews, with this being a movie review website and all. But a few days ago, I finished a book called The Disaster Artist that I had just picked up about two weeks before, and it’s incredibly rare for me to finish a book in such a breakneck speed. I think what interested me in this certain book was it’s subject matter. For those who don’t know, there is a film out there called The Room, and it’s considered by many to be, as the book’s tagline suggests, “The Greatest Bad Movie Ever Made”. And it’s a pretty accurate description of the film. It was Written, Produced, Directed by, and stars a man named Tommy Wiseau, whose acting is so unapologetically awful that it makes it’s scenes that should come off as heart wrenching and dramatic, end up being damn near slapstick and knee-slapping hilarious. The film didn’t make much of a dent when it was released in 2003, but over the years, thanks to midnight screenings and the internet, The Room has turned into this generation’s Rocky Horror Picture Show, and many (including myself) consider it to be one of the greatest cult classics of all time. And to be honest with you, it’s one of my favorite movies. I know that you’re probably thinking that I’ve been beat silly to think that this is a good film, and I don’t. I’m well aware of its atrocity and mediocrity, but when I finally watched the film earlier this year, I can’t remember laughing so hard while watching a film. I was in pain once the credits starting rolling at the end, and I was also pissed that it was over. My friends and I had such a blast watching this unnecessarily brilliant comedy that is about to step into mainstream pop culture in a big way. 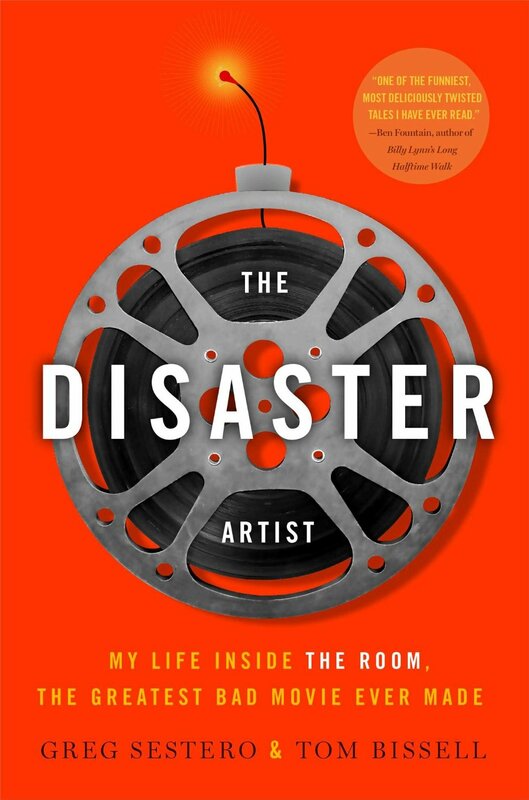 A few months back, James Franco bought the rights to the story from Greg Sestero, the book’s co-author and the actor who played Mark in the film, and Mr. Franco will be making a feature film adaptation of The Disaster Artist, where Franco will be playing Tommy Wiseau and Franco’s little brother Dave will be playing Greg Sestero in the film. So, I finally decided that I must read this incredibly fascinating tale, and so I ordered it on Amazon, got the book in the mail a few days later, and the rest is history. This is my review of Greg Sestero’s The Disaster Artist. Sestero was just a kid who wanted to be an actor, like a lot of people in this world. He writes about how his mother thought he was nuts for wanting to pursue a career of this kind. Sestero talks about his trials and tribulations of being a struggling actor living in San Francisco, going to acting class and so on. One day, at this said acting class, he comes across a mysterious and peculiar man sitting by himself in this class. Both men meet, and this is when Sestero meets Tommy Wiseau, a mysterious foreigner who will determine the fate of Sestero’s career for quite possibly the rest of Mr. Sestero’s life. Years later, after both men have known each other, Tommy decides that he will write a film (he often says that it’s a play and a movie, he can’t decide between the two) that will ultimately be The Room. Greg agrees to help out with the film, but not act. The book alternates in each chapter, with one chapter detailing Sestero and Wiseau’s friendship in the late 90’s-early 2000’s, and then the next chapter will be discussing the making of The Room, which is to say a very interesting experience for everybody involved. Mr. Sestero co-writes the book alongside Tom Bissell, but this is all Greg Sestero’s story, from beginning to end. This works because Mr. Sestero is the voice of reason throughout this tale, as he discusses the hijinks and curiosity of Tommy Wiseau, and how unexpected and mysterious he can be. Greg ends up being Tommy’s best friend for several years, and even throughout all of this time, we never learn anything about Tommy. He refuses to tell Greg about his past, where he’s from, how old he is, and so forth. You get a bit of a backstory at the end of the book (which I won’t reveal) about how Tommy got his start, and how he ended up making millions that he refuses to let anybody know about. It’s a very mysterious and unique relationship between the two, and while many of the scenarios in this book are pretty hilarious and hard to believe, I was surprised by the book at times. When we flashback in the book to the darker times in Greg and Tommy’s relationship, the book becomes a very human tale. Tommy, from what the book tells us, is a very lonely man, who doesn’t really know his place in the world, until he meets Greg in the book, and Greg ends up being possibly the best thing to ever happen to Tommy, and vice versa. But I would have to say that the best part of The Disaster Artist, is when Greg Sestero recounts the very lengthy and troubled production of The Room, where Tommy would casually fire his crew and many key elements of his cast without a blink of an eye. Tommy also didn’t know one thing about making a film, with the most apparent example being the fact that Tommy didn’t know the difference between shooting on film and shooting digitally with HD cameras, so he decided that he would shoot with both, which makes sense since the film’s production budget is a whopping 6 million dollars! If you can’t get over the fact that such a poorly produced and made film can cost that much money, then read this book, and you’ll find out why. Tommy’s unexpected nature is also highlighted in this section of the story, as Greg tells story’s of how Tommy threw a water bottle at a cast member, had every behind the scenes snip-bit filmed, mainly for Tommy’s viewing pleasure, how he could never remember his lines, and so on. This book is almost too good to be true, but according to Greg Sestero, and presumably everybody involved with the making of The Room, this is all true. As a man who loves movies, and the history of how these films were made, this film immediately connected with me like that. Greg Sestero and Tom Bissell tell a story that, in a bizarro and unique way, is a story of the American dream. Maybe not for Greg Sestero, but for Tommy Wiseau. While many think that Tommy made a so bad it’s good film, Tommy Wiseau believes that he made the next Streetcar Named Desire, and that Wiseau is this generations Marlon Brando. And, that’s OK. Wiseau embraces his unexpected star power, by hosting monthly fan screenings in the Los Angeles area (which is where Dave Franco announced that he would be playing Greg Sestero in the film). Greg and Tommy have been all over the world because of this film, and while Greg’s dream of being the next Brad Pitt may have been dashed because of this film, again, that’s OK, and it’s OK to Greg as well. For this and the reasons I mentioned above, The Disaster Artist is the best book I have read in years, and that’s saying something. I look forward to James Franco’s interpretation of this story, and my hope (along with Mr. Sestero’s) is that his film perfectly depicts this bizarre but heartfelt and sometimes sweet friendship between both Greg Sestero and Tommy Wiseau. The book is available for purchase on Amazon, and I highly recommend you to go read this book. If you are a fan of this film, or you want to know how a film like this got made, this is your book, my friends. June 11, 2014 in Book Reviews.